Building a secure and independent food system requires land, money and people with a passion for growing healthy produce. Creating urban farms—of all shapes and sizes and in all kinds of locations—provides a great start. Many faith-based organizations, corporations and schools in Linn County are surrounded by vacant and unused acres. 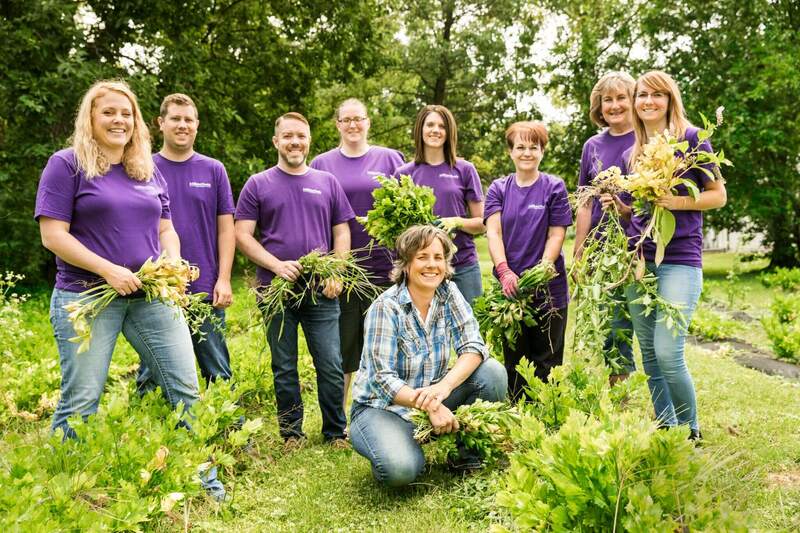 With rising costs for land, and with nearly 376,000 Iowans who are food insecure, our growing partners make a difference in our community by turning their extra land into urban farms. Through this partnership, the soil is put to work to grow fresh produce that is donated to community members in need. Our urban farming partnerships are a vital component of the work we do and our mission would not be possible without their contributions. One corporate farm can provide fresh and nutritional food for thousands of people. In fact, just one season’s harvest at the Rockwell Collins urban farm supplied 4,600 pounds of produce—enough for thousands of meals. Volunteers with The Accel Group (Formerly Millhiser-Smith) harvest celery in the fall of 2017. In 2018, The Accel Group is growing Kale which has yielded over 1,000 pounds of Kale! Many corporations in Linn County are surrounded by vast unused acres. One corporate farm can provide fresh and nutritional food for thousands of people. Farming benefits the corporation, too—with little effort. Volunteer programs such as Feed Iowa First engage employees by improving job satisfaction, morale and productivity. Starting a corporate farm creates a positive presence for the corporation within the community and assists with employee recruitment because new employees often select companies that share their values. The people we serve appreciate that the fresh produce Feed Iowa First distributes is super fresh and has not already spent time sitting on a supermarket shelf. Join the many corporations in the Cedar Rapids metropolitan area that are growing fresh produce for the neediest members of our community. More than 800 acres of grass surround faith-based organizations in Cedar Rapids, Marion, and Hiawatha. Those pretty lawns need lots of maintenance. How can we help them deliver greater value? By turning them into a Faith Farm. Think of it—just 500 of those 800 acres could produce enough vegetables to reach our goal of 2.5 cups of vegetables daily for the 26,000 citizens of Linn County who experience food insecurity. Feed Iowa First is very lucky to have volunteers that we consider Rock Stars! 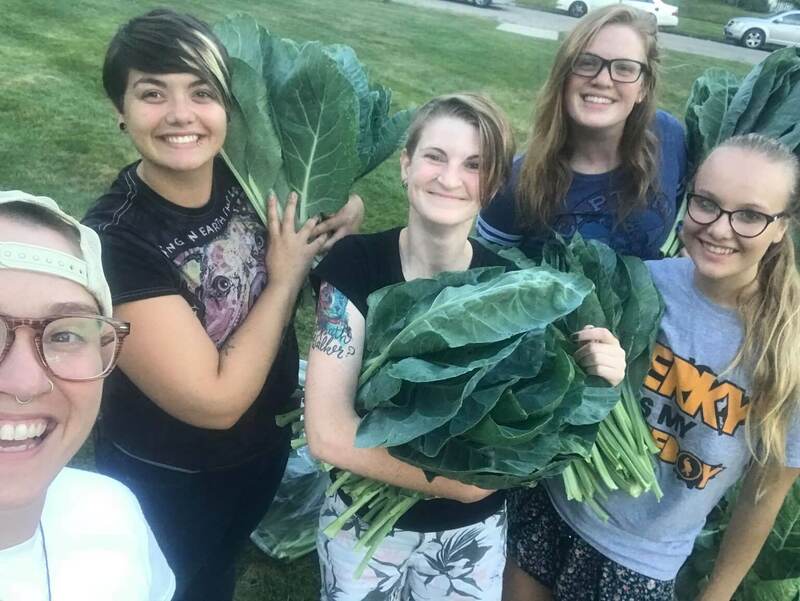 This fine group tends to the collard patch at First Congregational United Church of Christ in Cedar Rapids. Join the many faith-based organizations in the Cedar Rapids metropolitan area that are growing vegetables for the neediest members of our community. Join the many faith-based organizations in the Cedar Rapids metropolitan area that are growing fresh produce for the neediest members of our community. Growing the next generation of Iowa farmers starts in our schools—and Feed Iowa First helps schools set up hands-on activities and experiences to get students involved. Take a look at the open spaces around your school buildings and consider how they can be put to good use raising fresh produce to feed the neediest members of our community. Give your students the opportunity to learn firsthand about food independence, how fresh produce is grown and how their contribution can make a difference. Join our over 20 urban growing partners and turn the open land around your business, faith-based organization or school into productive farmland. Feed Iowa First wants to work with you! If you’re a private or commercial farmer, you can dedicate a portion of your existing farmland to grow fresh produce. Determine if your organization is interested. You may need to talk with your leadership team and staff responsible for the facilities and insurance. It’s helpful to know how much land you have and if you have access to water nearby. You’ll also want to get an idea of how many volunteers you can rely on to maintain the crops and land and if your organization is willing to allow them to work on the urban farm during business hours or after hours. Contact Feed Iowa First. Feed Iowa First provides training and resources to help with your farm. Feed Iowa First will help you determine which vegetables to plant (based on need) and help you start your farm and maintain it throughout the season. Have a planting day. Feed Iowa First will help you coordinate your planting day. We will till your soil, provide the plants, help you plant them and make sure you have everything you need for a successful harvest. Tend and harvest. Managing a 100-foot row typically takes one hour per week. That’s time spent watering, pulling weeds and harvesting your vegetables. Feed Iowa First requires produce to be refrigerated within two hours of harvest, so we’ll coordinate a time to receive or pick-up your produce. If your organization is interested in partnering with Feed Iowa First to help the neediest in our community get access to nutritious produce, please submit this form or give us a call at 319-775-0149.